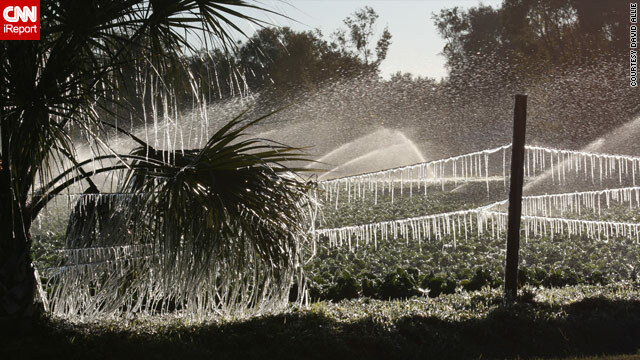 Icicles hang from plants on a Florida farm being irrigated to protect the crop from freeze damage. Atlanta, Georgia (CNN) -- Snow and ice dealt a major blow to U.S. air travel Thursday, while much of the nation shivered from record low temperatures. At least 400 flights at Chicago, Illinois', O'Hare International Airport were canceled. Arriving flights were being delayed an average of 45 minutes and outgoing flights about 30 minutes, according to the Federal Aviation Administration. Chicago's Midway Airport and Newark International Airport in New Jersey also reported delays. Those bottlenecks were affecting flights at many other international airports. Meanwhile, the National Weather Service was keeping an eye on a dangerous mix of ice and snow expected in the Southeast, where temperatures have dipped between 10 to 35 degrees below normal for the past two weeks, said CNN meteorologist Jacqui Jeras. Atlanta-based Delta Air Lines offered to issue winter weather travel waivers to Delta and Northwest passengers on flights to, from or through five states. Travelers can change their schedule without fees until Saturday if their routes include Alabama, Arkansas, Georgia, Mississippi or Tennessee. The arctic blast that began last weekend has been blamed for at least seven deaths across the nation. Record-breaking lows were forecast for two-thirds of the country, for most areas east of the Rockies. For some regions, even lower temperatures are on tap through the weekend, forecasters said. "But the brunt of the cold air will ride down the Mississippi River," said CNN meteorologist Rob Marciano, reporting from Memphis, Tennessee. Marciano said temperatures have been the lowest there in more than a decade. "You have people not used to this weather, and homes are not built for this weather. Yesterday alone, the city [Memphis] went around to turn on the heat for homes when people have not been able to pay [their utility bills]." Alabama issued a warning to drivers Thursday night, urging them to stay off icy roads as driving conditions were "becoming dangerous" with numerous accidents reported. Trooper Curtis Summerville with the Alabama State Patrol said the biggest problem on the roads was black ice on overpasses and bridges. But, he said football was helping keep people at home as University of Alabama fans cheered on their team in the National Championship Game against the University of Texas. A wind chill advisory was in effect until Friday in Arkansas, where readings were expected to drop below zero with winds of over 30 mph. A dusting of snow in Atlanta on Thursday night left roads slick after two weeks of below normal temperatures. CNN meteorologist Chad Myers noted that it was warmer in Fairbanks, Alaska, than it was in Atlanta on Thursday morning, calling the cold front sweeping the nation one that "we probably haven't seen for 15 years." In the Deep South, Florida was under a state of emergency because of the threat to the state's lucrative citrus and vegetable industries. Gov. Charlie Crist issued an order Tuesday aimed at helping farmers salvage what they can by lifting weight limits on trucks so already-harvested crops can more easily reach markets. Also suffering in the cold: sea turtles. Florida Fish & Wildlife officers have rescued 120 sea turtles after water temperatures in the 40s shocked their tropically inclined systems, according to CNN affiliate WPBF. "Their bodies are shutting down because they're too cold," Karrie Minch of the Merritt Island National Wildlife Refuge told WPBF. "If we don't rescue them, they'll end up expiring." Elsewhere Thursday, the high in Bismarck, North Dakota, was around 11 degrees below zero, with a wind chill of minus 35. Forecasters said the wind chill could dip to 52 degrees below zero overnight. Snowfall amounts of 4 to 8 inches were forecast Thursday for the upper Plains to the Northeast and as far south as Kentucky and Tennessee. Up to 7 inches fell in parts of Illinois. School districts in Omaha and Lincoln, Nebraska, called off classes Thursday and city governments reported burning through their entire snow removal budgets with a full two months of winter left. Jeras said the long stretch of cold weather in the South is "extremely unusual." Dallas, Texas, where it was 24 on Thursday, has been experiencing the longest stretch of cold weather in more than a decade, she said. The Southeast is expected to see lower temperatures by Saturday. CNN's Jim Kavanagh, Craig Johnson and Ed Payne contributed to this report.